North American Nickel excels at acquiring and pursuing top quality projects in politically safe mining jurisdictions and strives to ensure exceptional shareholder return on investment. North American Nickel's strategy for property acquisitions have been focused on a new district scale project opportunity in Greenland and several in two of the world’s best known and most prolific Nickel Camps in Sudbury, Ontario and Thompson, Manitoba. Initially the largest exploration property ever granted in Greenland, the Maniitsoq nickel-copper-PGE property in hosts numerous high-grade nickel-copper sulphide occurrences and it covers 3,601 km2 which is larger than the Sudbury Nickel Camp. The company focuses on using the most up-to-date technologies and applying them to their properties by very experienced and successful exploration team. The Company utilizes traditional prospecting methods, modern ground and helicopter-borne geophysical technologies, and innovative geochemical testing to prepare these prospective properties for drilling. North American Nickel trades on the TSX Venture Exchange under the symbol NAN. VMS Ventures Inc. (VMS:TSX.V) owns approximately 23.9% of North American Nickel and The Sentient Group owns approximately 41.3%. On August 15, 2011 the Company was granted an exploration license by the Bureau of Minerals and Petroleum of Greenland for exclusive exploration rights over an area totalling 4,841 square kilometres located near Sulussugut, Greenland. In 2104, that license has been reduced to 3,601 square kilometres. Historical work on the property (1962-2000) consisted of geological mapping, prospecting and shallow diamond drilling. The result was the recognition of a belt of nickel-copper-bearing norite intrusions currently referred to as the Greenland Norite Belt. 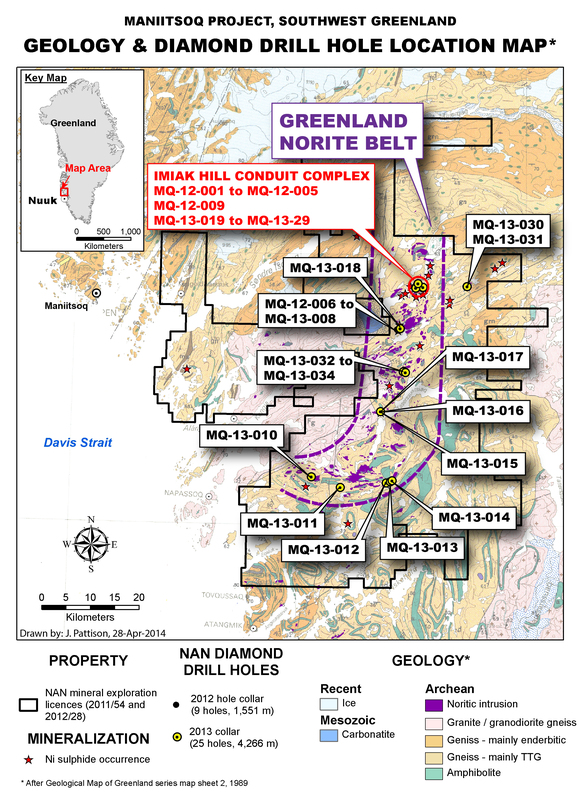 There was some notable success in the historic drilling particularly at Imiak Hill with a 9.85 m intersection grading 2.67% Ni and 0.60% Cu. Subsequently, extensive fixed wing time domain EM surveys were flown with limited success. High quality re-analysis of historical core confirmed the high-grade nature of nickel-copper mineralization and established the strong Maniitsoq nickel tenor. No further drilling was carried out. 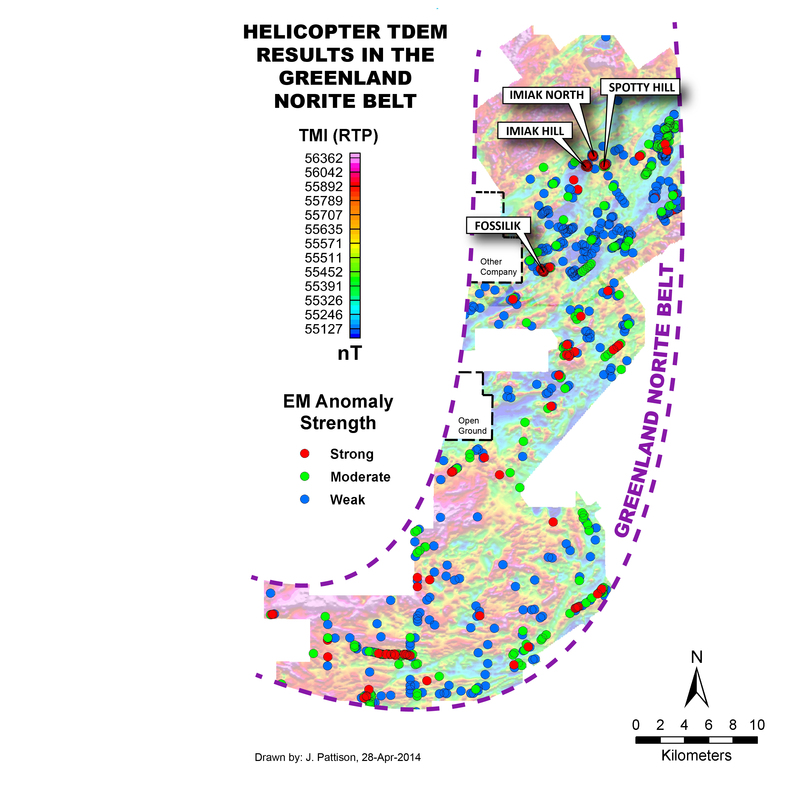 Subsequent to property acquisition NAN has flown 6666 line kms of helicopter-borne SkyTEM/VTEM surveys between 2011 and 2013 covering approximately 860 square kilometres focused mainly on the Greenland Norite Belt (GNB). Flight line spacing was 100-200 m. A total of 102 conductive zones are recognized. The EM conductors were modeled in three dimensions, providing well-defined sub-surface drill targets that when drill tested returned significant drill intercepts (Figure 3). In the 2012 drill program 9 holes were drilled for 1,551 m in three areas. Nickel, copper, cobalt and PGM mineralization was intersected at Spotty Hill and Imiak Hill, with anomalous mineralization intercepted at Fossilik II.